You are here: Home » MEDIA » Books » Weird Space: The Baba Yaga (book 3) by Eric Brown & Una McCormack (book review). Weird Space: The Baba Yaga (book 3) by Eric Brown & Una McCormack (book review). 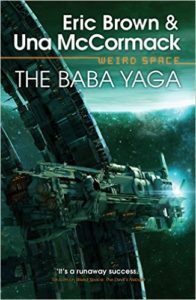 ‘The Baba Yaga’ is the third book in Abaddon’s ‘Weird Space’ series of SF novels, created by Eric Brown. I reviewed the first two books, ‘Devil’s Nebula’ (2012) and ‘Satan’s Reach’ (2013), both written by Brown, and enjoyed them. This volume is co-authored by Brown and Una McCormack, a British genre writer best known for ‘Star Trek’ and ‘Doctor Who’ tie-in novels. As the book opens, the hideous and brutal race of aliens known as ‘the Weird’ have just launched an attack on Braun’s World. This is a colony planet rather too close to the core of the human Expansion for comfort. The indiscriminate slaughter that follows is monitored remotely by ‘the Bureau’, the covert intelligence service based on the Expansion’s most populous planet, Hennessy’s World. The Bureau’s leadership are split over how to respond to this latest attack, with a hard-line contingent led by former soldier Adelaide Grant calling for an immediate orbital bombardment of Braun’s World to prevent the Weird or any colonist infected with their mind-control parasites from escaping and potentially bringing infection and death closer to the core. The fact that this would necessarily involve the deliberate murder of millions of colonists by their own Government does not appear to phase Grant but is central to the objections of Delia Walker, a senior Bureau analyst who thinks that a diplomatic solution needs to be explored, given that nobody yet has a clue what is motivating the Weird to attack one human colony planet after another. Suffice it to say that, in the face of the Weird’s extreme violence on Braun’s World, Walker’s softer approach is rejected in favour of a military response and Braun’s World is indeed destroyed from orbit. In the aftermath of this decision, Walker finds herself disillusioned with the Bureau, not only professionally but also personally, as her reluctance to tell her bosses about an unplanned pregnancy is used by Grant and the other hawks as an excuse to suspend her from work. Realising that she can do nothing useful while she remains on Hennessy’s World, Walker hires a dodgy cargo freighter pilot called Yershov to smuggle her off-planet in his rickety ship, the Baba Yaga of the book’s title. She wants to investigate some rumours that she’s heard of a planet, well beyond the edge of the Expansion, where humans allegedly co-exist in peace with the Weird and with their historical alien enemies, the Vetch. Cut off from all the resources of the Bureau, will she be able to find this planet on her own? I enjoyed several aspects of this novel. Chief amongst them was the extensive list of supporting characters, featuring amongst others a defrocked priest, a doctor who seems to find it difficult to keep a confidence, a Vetch child who adopts Delia Walker as her surrogate mother after she rescues her from slavery and a set of ultra-violent sociopaths used by the Bureau to do their dirtiest jobs. They provide a richness and diversity to the story which I really valued. Another strong element of the book was the range of settings within which the action took place, including several different planets, a couple of starships and a gritty space station. Each of these is depicted with great attention to detail, adding hugely to the verisimilitude of the narrative. Unfortunately, these strengths were for me outweighed by one major flaw. This is to be found in the person of the story’s main protagonist, senior Bureau analyst Delia Walker. As far as I can see, the intention was that Walker would come across as a tough, no-nonsense intelligence operative, whose crisis of conscience forces her to leave her comfortable job and try to uncover the truth despite her former employers, rather than alongside them. This is a classic hero’s journey and one I’m sure I would have enjoyed reading. However, that’s not the way that Walker or her mission came across to me. Instead, I found her to be an arrogant, self-important, controlling bully who uses threats that she can’t herself back up in order to make people do what she wants. Saying ‘You’ve never met anyone like me’ to the pilot you’ve just hired may initially sound tough, but if you never do anything to back this boast up then you end up looking like an egotist. If you’ve spent a couple of decades proudly working for a repressive arm of government that uses torture to extract information from suspects, your sudden change of heart over their methods may not sound very principled when it becomes clear that it is purely to protect your own privacy. More worryingly, for a woman whose split with her former employers is supposedly due to her wish to find a diplomatic rather than a military solution to humanity’s existential clash with the Weird, Delia Walker seems remarkably addicted to threatening violence to anyone who disagrees with her. I’m afraid I found her a deeply unpleasant character, which made it difficult to follow her on her quest with any great enthusiasm. ‘The Baba Yaga’ takes Eric Brown’s ‘Weird Space’ series in interesting new directions, exploring the interactions between humanity and the aliens they encounter through a political and social lens. I enjoyed many of the new settings and the extensive cast of supporting characters, but for me the book was spoiled by an unsympathetic protagonist. Even so, I enjoyed spending more time in the ‘Weird Space’ story universe, and look forward to watching how matters develop between humanity, the Vetch and the Weird in future. « Awesome science fiction and fantasy round-up (Offworld Report: Thursday 7th July 2016).